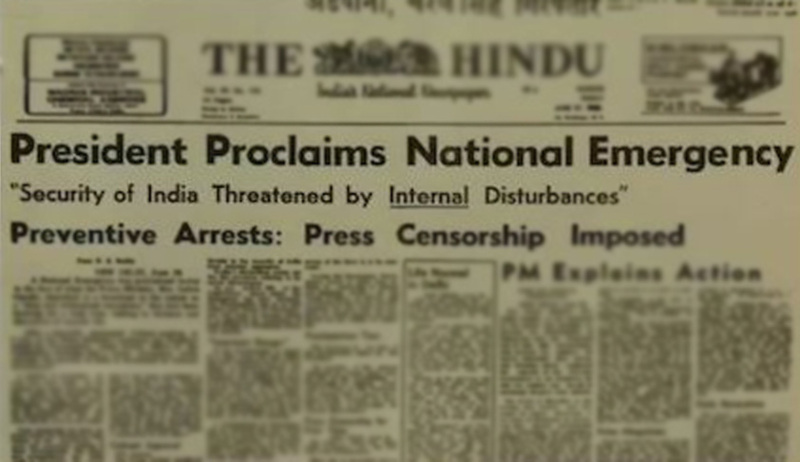 Despite getting a conditional stay order from the vacation bench of Justice V. R. Krishna Iyer against the order of the Allahabad High Court, the then Prime Minister Mrs. Indira Gandhi was imposed the National Emergency on the night of 25 June 1975. It is said that she was not happy with the conditional stay as she was facing the protest of different political outfits led by Jai Prakash Narain who were demanding her resignation from the office of the Prime Minister. Mr. Morarji Desai was even more aggressive. He told a foreign journalist: ‘We intend to overthrow her, to force her to resign. For good. The lady would not survive our movement….Thousands of us will surround of her House to prevent her from going out…We shall camp there night and day.” But both J P and Morarji Desai underestimated Mrs. Indira Gandhi. She did what no one never imagined she would do. At 11 p.m. on 25th June, 1975, accompanied by Siddharth Shankar Ray, the then Chief Minister of West Bengal, whom she had entrusted the work of checking the constitutional pros and cons of the Emergency, went to Rashtrapati Bhavan to inform the then President Fakhruddin Ali Ahmed that her Government had decided to impose a state of internal Emergency at once. Her Government meant herself as she did not consult her Cabinet colleagues for taking any such drastic decision. There was a famous saying that there was only one Cabinet Minister in Indira Gandhi’s Cabinet, and that was only Mrs. Gandhi herself. One of the lessons of the internal Emergency has been not to place excessive reliance on constitutional functionaries. They failed us-the President, Ministers of the Government, most of the Members of Parliament and even senior judges of our Court-the latter for their majority judgment in April 1976 in ADM Jabalpur case-upholding the Proclamation of Internal Emergency. The then Prime Minister Mrs. Indira Gandhi justified the Emergency as necessary not only to preserve order but also to save democracy, protect the social revolution, and preserve national integrity-in sum, to preserve the seamless web. The rebellion threatening the country, Mrs. Gandhi said, was the manifestation ‘of the deep and wide conspiracy brewing ever since she began to introduce certain progressive measures of benefit to the common man and woman of India. Up to some extent Mrs. Gandhi was right as the opposition was also misusing the judicial verdict against her and was adamant to route her out from the Prime Minister’s position. They, the leaders like JP and Morarji Desai, were underestimating Mrs. Gandhi and instigated her to follow the coercive measures. They were not even ready to wait for the outcome of her appeal which was pending before the Supreme Court for final adjudication by a larger bench. As stated earlier, along with the Proclamation of internal Emergency, peoples’ fundamental rights were also suspended by the President under Article 359 of the Constitution by issuing a Presidential Order on 27th June, 1975 and thousands of people particularly the leaders of opposition parties such as Morarji Desai, Jai Prakash Narain, Charan Singh, Atal Bihari Vajpayee and L. K. Advani were detained under the Maintenance of Internal Security Act. Preventive detention orders were made freely, severe press censorship was imposed and civil liberties were thrown into dustbin. Then came the 38th Constitutional Amendment making the satisfaction of the President with regard to the existence of circumstances rendering it necessary to promulgate an Ordinance final, conclusive, and non-justiciable. Similarly, the satisfaction of the President in regard to Proclamation of Emergency under Articles 352 and 360 of the Constitution was also made final, conclusive and non-justiciable. Then the 39th Constitutional Amendment was brought out to undo the judgment of the Allahabad High Court which had set aside the election of Mrs. Indira Gandhi. This constitutional amendment provided that no election to either House of Parliament of any person who held the office of the Prime Minister at the time of such election or who was appointed as Prime Minister after such election shall be called in question except before the authority or body and in such manner as may be prescribed by law made by Parliament. The election of such person was thus removed from the purview of the courts which had otherwise jurisdiction to decide that matter. It was further declared that no law made by Parliament before the commencement of the 39th Constitutional Amendment in so far as it related to election petitions and matters connected therewith shall apply or shall be deemed ever to have applied to or in relation to the election of any person who was Prime Minister; such election shall not be deemed to be void before such commencement; and notwithstanding any order made by any court such election shall continue to be valid in all respects and any findings on which such order was based shall be deemed to have always been void and of no effect. The amendment was a blatantly perverse and outrageous attempt not merely to overrule the judgment of the Allahabad High Court, but to immunize the election of a single individual, namely, Mrs. Indira Gandhi. Perhaps it was the grossest abuse of legislative power in any country claiming to be wedded to parliamentary democracy and rule of law. The 1975 Emergency was the daylight robbery of human rights. This Emergency was the negation of constitutional ethos and principles. It was a clear example of dictatorship and authoritarian proclamation. The people of the country assumed that had Justice Krishna Iyer granted a full stay as requested by the then Prime Minister Indira Gandhi’s counsel Nani Palkhivala, the Emergency could not have been declared in the country. Mrs. Gandhi was expecting absolute stay from the Court and had prepared her speech to address the nation on 23rd June, 1975 at 8.15 p.m. Even Justice Krishna Iyer also mentioned that some Congressmen blamed him for creating such situation which instigated Prime Minister Mrs. Indira Gandhi to declare the Emergency. But this is a matter of fact that two judges Justices Jagmohan Lal Sinha and V. R. Krishna Iyer created such situations which shook the power corridors and changed the equations. Had Justice Sinha decided in favour of Mrs. Gandhi, the situation would have been different. Justice Sinha demonstrated unique courage and conviction to the cause of rule of law and constitutionalism. He was a fearless judge. Mr. Shanti Bhushan states that Justice Sinha’s judgment was an act of great courage. This courage was in line with the courage shown later by Justice H. R. Khanna of the Supreme Court in ADM Jabalpur case. The courage of these two great judges was in clear contrast to the judgment of other judges of the Supreme Court in the ADM Jabalpur case in which four judges of the Supreme Court except Justice Khanna declared that during the Emergency there was no right to life of liberty and even if people were shot illegally, the courts could not intervene. He decided as per the letter and spirit of the law which went against Mrs. Gandhi and changed the horizons of politics in our country. Krishna Iyer’s conditional stay also became the bone of contention between the ruling party and the opposition which ultimately led the country towards Emergency. Khanna was a titan morally and jurally. Judges make history not by virtue of a long tenure or by pomp of office as Chief Justices. His career was not marked by either of these claims but he is still a lasting legend. His single monumental dissent, and his majestic resignation when superseded, made him a hallowed judicial celebrity. Any student of the Supreme Court will be arrested by the extraordinary event that made Khanna illustrious. For him, the voice of the conscience and the value of human rights were burning realities. As in the case of Lord Coke and Lord Atkin, these were for him non-negotiable noesis and oath-bound obligation. Of the first period, the historian will say that the Supreme Court moved towards its finest hour, a day before the Proclamation of Emergency, when on June 24, 1975, Krishna Iyer J., following judicial precedents, rejected an application made by Mrs. Gandhi that the Allahabad High Court’s order, finding her guilty of corrupt election practices and disqualifying her for six years, should be totally suspended. In the best traditions of the judiciary, Justice Krishna Iyer granted a conditional stay of the appeal-although he had been reminded by her eminent counsel Mr. Nani A. Palkhiwala that ‘the nation was solidly behind her as Prime Minister’ and that ‘there were momentous consequences, disastrous to the country, if anything less than the total suspension of the order under appeal were made’. Great praise indeed by a great jurist for a great judge, who rendered a great service to the nation. To Justice Krishna Iyer, law was ‘value-loaded.’ His social philosophy was more than an interpretative tool. It was the mainspring of all his judicial dicta. He was a fearless and favourless judge. He recalls in his book Off the Bench how the then Law Minister H.R. Gokhale, a good friend, expressed a desire to meet him at his residence after Mrs. Indira Gandhi’s disqualification by the Allahabad High Court judgment in connection with her appeal. He politely refused to see him and indicated that the correct way was to file the appeal in the Registry which would be taken up promptly. Indeed, it was a right step of Justice Krishna Iyer taken as per the traditions of the judicial system of the country! Later, even Justice Krishna Iyer also criticized the Emergency and communicated his feelings to Mrs. Gandhi in a private meeting. I spoke to Mr. Gokhale, the Law Minister, yesterday at 1 o’clock, requesting him to covey to you, with great regret, I had decided to withdraw from the appeal in view of the development in the morning. I would have normally called upon you personally and explained the position, but in the circumstances of yesterday, it did not seem feasible. Then I again spoke to Mr. Gokhale twice in the afternoon and I do hope you got the message before it was released to the press at about 6 p.m. I was very anxious that you should know about it from me first. There is nothing on record to indicate whether Mrs. Indira Gandhi replied to Nani Palkhivala’s above mentioned letter or whether she called for him to ask for a personal explanation. Anybody who believes in democracy will certain appreciate the stand taken by Nani A. Palkhivala in returning Mrs. Gandhi’s brief in protest to Emergency. It was a courageous act which is commendable. It was a clear lesson to Mrs. Gandhi that she cannot take people granted. Lawyers have not only to defend their clients; they are equally bound to protect the law. Mrs. Gandhi’s decision for imposing Emergency was not good for the democracy and constitutional governance. The Emergency period (1975-77) was the worst time in the constitutional history of our country when human rights of the masses were violated on large scale by the power-intoxicated government and its agencies and even the Supreme Court could not protect the peoples’ rights and surrendered before the dictatorial forces in the Habeas Corpus case. But when the regime was changed by the democratic means in 1977, the Supreme Court asserted itself and started a new era of judicial activism. Even during the Emergency, the Supreme Court struck down the 39th Constitutional Amendment in Indira Nehru Gandhi v. Raj Narain case, by a majority which had purported to immunize the election of Mrs. Indira Gandhi from any judicial scrutiny. Justices Khanna, Mathew and Chandrachud constituted the majority which struck down the amendment on the ground that it offended the basic structure of the Constitution which provided for a judicial process to challenge an election while Chief Justice Ray and Justice Beg who constituted the minority held that the basic structure of the Constitution was not touched in any way and on that ground upheld the validity of the amendment. Justice Mathew described the amendment as ‘the result of the exercise of an irresponsible, despotic discretion governed solely by’ what he deemed ‘a political necessity or expediency’! If it was a legislative judgment disposing of a particularly election dispute, it was not the exercise of constituent power. If it was the exercise of constitutional power, it would damage or destroy an essential feature of democracy as established by the Constitution, namely, the resolution of election disputes by an authority by the exercise of judicial power by ascertaining the adjudicative facts and applying the relevant law for determining the real representative of the people. Justice Chandrachud observed that the amending provision was an outright negation of the right to equality guaranteed by Article 14, a right which more than any other right was a basic postulate of the Constitution. He held that the offending clauses were arbitrary and calculated to damage or destroys the rule of law. Let down by the courts in ADM Jabalpur case, the people of India who are sovereign themselves stood up for democracy and liberty and showed the door to the Government Mrs. Indira Gandhi and her sycophants in the general elections of March 1977. The new Parliament by the 43rd and 44th Constitutional Amendments undid to a large extent the mischief of the 38th and 42nd Constitutional Amendments. In particular regard to Proclamation of Emergency, several safeguards were additionally provided. One of the safeguards was that no proclamation of Emergency could be issued by the President unless the decision of the Union Cabinet headed by the Prime Minister is communicated to the President in writing. The approval of the proclamation by the Parliament could only be by a majority of the total membership of each House and by a majority of not less than two-thirds of the members of the House present and voting. Another important provision was that fundamental rights guaranteed by Article 20 and 21 could not be suspended under any circumstances, thus undoing the harm done by the Habeas Corpus case. And after Emergency, the Supreme Court asserted itself on a large scale and came to the rescue of the human rights and dignity. The Emergency of 1975 was the darkest period in the constitutional history of India. It was the day light robbery of human rights. It was the negation of rule of law and democracy. The people shocked that the founding fathers gave a constitution to the country and how that constitution was thrown into dustbin by Mrs. Gandhi to protect her seat. It is rightly said that the fear to lose power is the biggest fear which Mrs. Gandhi had in 1975. The things were made worse by the judgment of the Supreme Court in ADM Jabalpur case. This judgment is a blot on the forehead of the Supreme Court. This shows how even the guards can betray the people during crisis. The fear of supersession was easily reflected on the majority judges such as Justice Beg, Bhagwati, and Chandrachud. The press was censored and people were deprived of information. A dictatorial regime was established. Fear was sanctioned by the apex court. Parliament was failed. The Constitution was converted into a periodical. Constitutional amendments were carried out to serve the individual interests. Only the God was the defender of the people. Such a dangerous atmosphere the Emergency brought out in our country. Can the Emergency be declared again? Yes, it can. But not on the ground of internal disturb and Articles 20 and 21 cannot be suspended. Now as per the existing constitutional provisions the President cannot declare Emergency on the sole advice of the Prime Minister. He is required to act on the written advice of the Cabinet. The President can ask the Cabinet to reconsider its decision once but thereafter he is bound to act as per ministerial advice. The Parliament can check the validity of the Emergency and can revoke it any time. If the Emergency is proclaimed on extra-constitutional grounds, the courts can check the legality of such emergency. Given the state of strong media and public opinion, no Government can declare Emergency without any solid ground. The lessons of 1975 Emergency are duly incorporated in the Constitution by the 44th Constitutional Amendment Act. The vigilant people in 21st century will hardly tolerate any dictatorial regime. Even in 1975 we had courageous men and women amidst us who opposed and challenged the dictatorial powers at the cost of their future prospects. The great souls of Justice H. R. Khanna and Sinha will encourage the people to stand against injustice and lawlessness.